When you think of famous all-AE86 teams from the 90s, the first one that usually comes to mind is Rough World. They were so famous that their team stickers were even being commercially replicated and sold in places like Super Autobacs. However, on the western side of Tokyo, GunTama.R (a combination of Gunma and Saitama) reigned supreme on the touge, and circuits like Nikko and the now defunct Miu Circuit. The team doesn’t exist any more though, and the incredible stories I actually have been able to pull out of a few people have been followed by a caution to never repeat them to anybody. Let’s just say that they’d put the storyline of Initial D to shame. I’ve heard firsthand from one person who saw the leader of GunTama.R do a 46 second lap of Nikko Circuit in a completely standard AE86 in the rain. Keep in mind that the current AE86 record is a low 38 in the dry, held by the CBY Trueno. 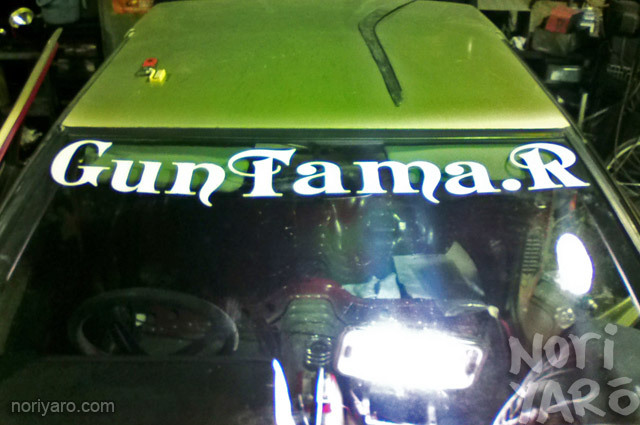 This photo was taken shortly before this sticker was removed, as this AE86 shell that used to belong to a member of the team that went by the nickname “Gachapin”, has since been rebuilt and repainted by a new owner. Dammit, you can’t tease us like this and not share more! Or at least some old pictures of them in action? Thats HELLA MEAN to tease like this! Damn this was a teasing write-up. I wished there was a good story in that post :p , but i must say i find it very respectfull that these (awesome) stories are not just put on some blog for our amusement. A teasing but interesting read! Only in Japan can a really bad name be changed from FAIL to HERO in the space of about five short paragraphs. AAAAARRRGGGGHHHHHHHH!!!! !I feel like hunting you down and forcing you to tell me these stories, Alexi!!!! That 1-sentence Nikko legend summary gave me goosebumps. That alone is enough to put Initial D to shame in my book. Now I won’t sleep for a week just thinking about what kind of other god-like abilities the GunTama.R guys had (or have). May you please tell us 1 more summary!! please? wow thats awesome… the mystery alone intrigues me. reminds me of some stories i heard about an aussie group called dorished or something. they were around a few years ago and did a similar thing, illegal street drifting and racing and stuff. i even heard that they had a time trial thing at a bunch of different mountain roads in sydney somewhere, like a competition trying to set records. a mate of a mate i met once was boasting about racing one of them and losing in his S2000 to some hachi from their group. i had only just seen initial d then, and it sounded like something lifted from the series lol. Ok i owe you some beer and you tell me the whole story then. this fascinates me, i want to hear more. there are a few stories from the mountains around sydney…! pretty sure there are still groups doing this stuff here too…i’ve seen a couple of things i’m best not talking about, lol. I’m sure they are world wide, and more common that most would believe. @Adam – I head of those dorished guys too. Heard some mental stories about mountain racing and tandem battles. Rumor has it the hachi was almost stock standard and there was a 180sx that used to terrorize other mountain racers down some gorge road. jimmo, i think the road the 180 was on was galston gorge, near hornsby or something. ^^^shame on you to use such lingo in this post. sacrilegious stuff Alexi! Damn i love it! makes all my downloaded intial d,wangan midnight anime and manga books so.. not good enough?? when theres true storys out there and even current storys untelling in the making! Gotta get insured on my 86 again soon! Please do a write up on the storys via email or post!!! i pinky promise to destroy after reading!!!!!!! Can you do some kind of story on another team or post some pics or something?? Hey i found another GunTama.R its in a Hyper Rev. All the way in the back, I’m not sure but I think it did Nikko in 44″896.